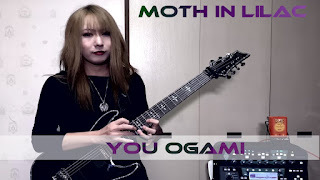 Actually, I joined the band "Moth in Lilac" (Goth / HeavyRock / Nu-metal / Metalcore) from December 2017, and we are performing live activities there! Please come and have a chance to deliver my performance directly to the viewers who had been my dream for a long time. I would like to post as much video as possible, even from the movies as well! We will continue to disseminate the contents of future activities on Twitter etc, so please follow up by all means.